Both carnations (Dianthus caryophyllus) and pansies (Viola x wittrockiana) make beautiful additions to a garden, adding pops of color to flower boxes, garden bedding and floral arrangements. Although these plants are quite lovely, it's best to keep feline friends away from them because they are considered mildly toxic to pets. Don't worry if your cat has eaten these plants, though, as the effects are usually not that serious. Carnations, herbaceous perennials, grow well in U.S. Department of Agriculture plant hardiness zones 5 through 10, depending on the cultivar. They produce showy, fragrant flowers that attract butterflies and grow in a range of colors, including shades of white, red and yellow. The blooms have a spicy, clove-like scent, which is why their essential oils are commonly used in perfumery. Carnations thrive in a loamy, slightly-alkaline and well-drained but moist soil and full sun. Flowers are 2 to 3 inches across and each bloom sits atop a tall pedicel, usually up to a foot high. Plants are usually treated as annuals and bloom from May to July. Carnations are classified as mildly toxic to cats by the American Society for the Prevention of Cruelty to Animals. Contact with carnations, especially the leaves, can cause mild dermatitis if a cat touches it, as well as mild gastrointestinal upset if ingested due to an unknown irritant. Although carnation blooms are used as garnishes in salads or candied in desserts, the plants are classified as mildly toxic to humans and animals by the University of California Division of Agriculture and Natural Resources. Symptoms of poisoning in your cat may include vomiting or diarrhea after it ingests any part of the plants. Consult with a vet if your kitty has been munching on carnations. He can recommend if any supportive care is necessary. 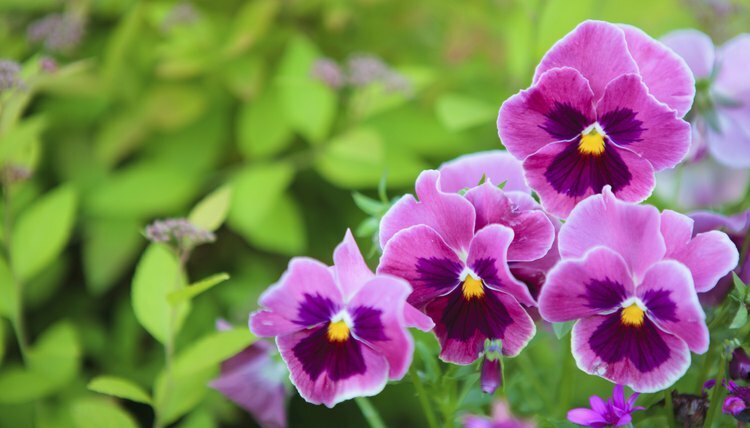 Like carnations, pansies produce showy, fragrant blooms that tend to attract butterflies. The five-petaled flowers come in many colors including blue, white, yellow, red, apricot and purple. The blooms usually have contrasting whiskering on their petals or splotches of dark color in their centers. Pansies are herbaceous perennials that grow well in U.S. Department of Agriculture plant hardiness zones 5 through 11, depending on the cultivar. Pansies grow best in full sun to partial shade in well-drained rich soil. Like carnations, they are often treated as annuals and grown in flower beds, window boxes and containers. Flowers bloom from April to June. Although the ASPCA doesn't list pansies as toxic to cats, the Morris Veterinary Center states that they are mildly toxic to felines. The University of California Division of Agriculture and Natural Resources lists only the seeds as being mildly toxic. Like carnations, pansy flowers are sometimes served in salads or candied and served with desserts for people. Although opinions seem to differ on whether the plants or their seeds are toxic to kitties, it's best to keep your cat away from them. The feline might experience some gastrointestinal distress after munching on these flowers. Although these are likely a better choice than carnations in a cat-friendly garden, keep your kitty away from any flowers to protect both the feline and the beauty of garden blooms. Plants for a Future: Dianthus caryophyllus -- L.
University of Wisconsin Health: Common Plants -- What’s Poisonous and What’s Not?